At some point in the life-cycle of an innovation, there is the possibility of crossing an invisible line called the tipping point. This happens when enough people have experienced the benefits of the innovation and believe that the innovation is the future. These lone innovators start to connect and build a new community. It is an emergent behaviour of a complex adaptive system. This week I experienced what could be a tipping point. I attended the Q-Community launch event for the West Midlands that was held at the ICC in Birmingham … and it was excellent. The invited speakers were both engaging and inspiring – boosting the emotional charge in the old engagement batteries; which have become rather depleted of late by the incessant wailing from the all-too-numerous peddlers of doom-and-gloom. There was an opportunity to re-connect with fellow radicals who, over nearly two decades, have had the persistent temerity to suggest that improvement is necessary, is possible, have invested in learning how to do it, and have disproved the impossibility hypothesis. There were new connections with like-minded people who want to both share what they know about the science of improvement and to learn what they do not. And there were hand-outs, side-shows and break-outs. Something for everyone. 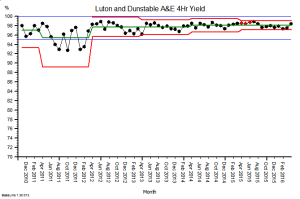 Improving safety, flow, quality and affordability of unscheduled care of the elderly. I sincerely hope that in the future, with the benefit of hindsight, we in the West Midlands will say – the 19th July 2017 was our Q-Community tipping point. And I pledge to do whatever I can to help make that happen. On 5th July 2018, the NHS will be 70 years old, and like many of those it was created to serve, it has become elderly and frail. We live much longer, on average, than we used to and the growing population of frail elderly are presenting an unprecedented health and social care challenge that the NHS was never designed to manage. The creases and cracks are showing, and each year feels more pressured than the last. “My mother-in-law is 91, in general she is amazingly self-sufficient, able to arrange most of her life with reasonable care at home via a council tendered care provider. She has had Parkinson’s for years, needing regular medication to enable her to walk and eat (it affects her jaw and swallowing capability). So the care provision is time critical, to get up, have lunch, have tea and get to bed. She’s also going deaf, profoundly in one ear, pretty bad in the other. She wears a single ‘in-ear’ aid, which has a micro-switch on/off toggle, far too small for her to see or operate. Most of the carers can’t put it in, and fail to switch it off. Her care package is well drafted, but rarely adhered to. It should be 45 minutes in the morning, 30, 15, 30 through the day. Each time administering the medications from the dossette box. Despite the register in/out process from the carers, many visits are far less time than designed (and paid for by the council), with some lasting 8 minutes instead of 30! Most carers don’t ensure she takes her meds, which sometimes leads to dropped pills on the floor, with no hope of picking them up! While the care is supposedly ‘time critical’ the provider don’t manage it via allocated time slots, they simply provide lists, that imply the order of work, but don’t make it clear. My mother-in-law (Mum) cannot be certain when the visit will occur, which makes going out very difficult. The carers won’t cook food, but will micro-wave it, thus if a cooked meal is to happen, my Mum will start it, with the view of the carers serving it. If they arrive early, the food is under-cooked (“Just put vinegar on it, it will taste better”) and if they arrive late, either she’ll try to get it out herself, or it will be dried out / cremated. Her medication pattern should be every 4 to 5 hours in the day, with a 11:40 lunch visit, and a 17:45 tea visit, followed by a 19:30 bed prep visit, she finishes up with too long between meds, followed by far too close together. Her GP has stated that this is making her health and Parkinson’s worse. Mum also rarely drinks enough through the day, in the hot whether she tends to dehydrate, which we try to persuade her must be avoided. Part of the problem is Parkinson’s related, part the hassle of getting to the toilet more often. Parkinson’s affects swallowing, so she tends to sip, rather than gulp. By sipping often, she deludes herself that she is drinking enough. She also is stubbornly not adjusting methods to align to issues. She drinks tea and water from her lovely bone china cups. Because her grip is not good and her hand shakes, we can’t fill those cups very high, so her ‘cup of tea’ is only a fraction of what it could be. As she can walk around most days, there’s no way of telling whether she drinks enough, and she frequently has several different carers in a day. When Mum gets dehydrated, it affects her memory and her reasoning, similar to the onset of dementia. It also seems to increase her probability of falling, perhaps due to forgetting to be defensive. When she falls, she cannot get up, thus usually presses her alarm dongle, resulting in me going round to get her up, check for concussion, and check for other injuries, prior to settling her down again. These can be ten weeks apart, through to a few in a week. When she starts to hallucinate, we do our very best to increase drinking, seeking to re-hydrate. On Sunday, something exceptional happened, Mum fell out of bed and didn’t press her alarm. The carer found her and immediately called the paramedics and her GP, who later called us in. For the first time ever she was not sufficiently mentally alert to press her alarm switch. After initial assessment, she was taken to A&E, luckily being early on Sunday morning it was initially quite quiet. The Hospital is on the boundary between two counties, within a large town, a mixture of new build elements, between aging structures. 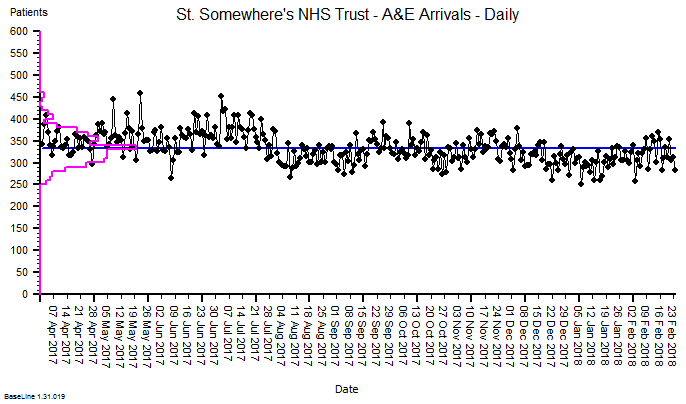 There has been considerable investment within A&E, X-ray etc. due partly to that growth industry and partly due to the closures of cottage hospitals and reducing GP services out of hours. It took some persuasion to have Mum put on a drip, as she hadn’t had breakfast or any fluids, and dehydration was a probable primary cause of her visit. They took bloods, an X-ray of her chest (to check for fall related damage) and a CT scan of her head, to see if there were issues. After about six hours, during which time she was awake, but not very lucid, she was transferred to the day ward, where after assessment she was given some meds, a sandwich and another drip. Later that evening we were informed she was to be kept on a drip for 24 hours. The next day (Bank Holiday Monday) she was transferred to another ward. When we arrived she was not on a drip, so their decisions had been reversed. So, to get mum out, I had to arrange a 24/7 care package, and nowhere was open until the next day. Trying to escalate care isn’t going to be easy, even in the short term. My emails to ‘usually very good’ social care people achieved nothing to start with on Tuesday, and their phone was on the ‘out of hours’ setting for evenings and weekends, despite being during the day of a normal working week. Eventually I was told that there would be nothing to achieve until the hospital processed the correct exit papers to Social Care. When we went in to the hospital (on Tuesday) a more senior nurse was on duty. She explained that mum was now medically fit to leave hospital if care can be re-established. I told her that I was trying to set up 24/7 care as advised. She looked through the notes and said 24/7 care was not needed, the normal 4 x a day was enough. (She was clearly angry). Mum was given her food, it consisted of some soup, which she couldn’t spoon due to lack of meds and a dry tough lump of gammon and some mashed sweet potato, which she couldn’t chew. On Wednesday I spoke with Social Care to try to re-start care to enable mum to get out. At that time the social worker could neither get through to the hospital nor the carers. We spoke again after I had arrived in hospital, but before I could do anything. On arrival at the hospital I was amazed to see the white-board declaring that mum would be discharged for noon on Monday (in five days-time!). I spoke with the assigned staff nurse who said, “That’s the earliest that her carers can re-start, and anyway its nearly the weekend”. She replied, “No they’ll have gone home by now, and I’ve not seen them all day” I told her that they work shifts, and that they will be here, and made it quite clear if she didn’t contact SHEDs that I’d go walkabout to find them. A few minutes later she told me a SHED member would be with me in 20 minutes. While the hospital had resolved her medical issues, she was stuck in a ward, with no help to walk, the only TV via a complex pay-for system she had no hope of understanding, with no day room, so no entertainment, no exercise, just boredom encouraged to lay in bed, wear a pad because she won’t be taken to the loo in time. When the SHED worker arrived I explained the staff nurse attitude, she said she would try to improve those thinking processes. She took lots of details, then said that so long as mum can walk with assistance, she could be released after noon, to have NHS carer support, 4 times a day, from the afternoon. 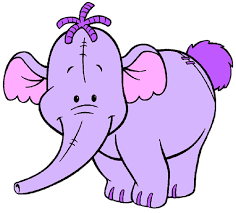 She walked around the ward for the first time since being admitted, and while shaky was fine. This story is not exceptional … I have heard it many times from many people in many different parts of the UK. It is the norm rather than the exception. 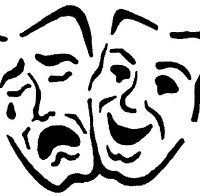 It is the story of a fragmented and fractured system of health and social care. It is the story of frustration for everyone – patients, family, carers, NHS staff, commissioners, and tax-payers. A fractured care system is unsafe, chaotic, frustrating and expensive. There are no winners here. It is not a trade off, compromise or best possible. It is just poor system design. 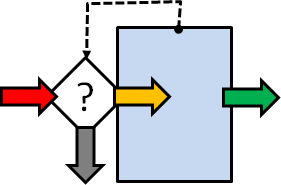 What we want has a name … it is called a Frail Safe design … and this is not a new idea. It is achievable. It has been achieved. The reason is simple – the NHS does not know any other way. 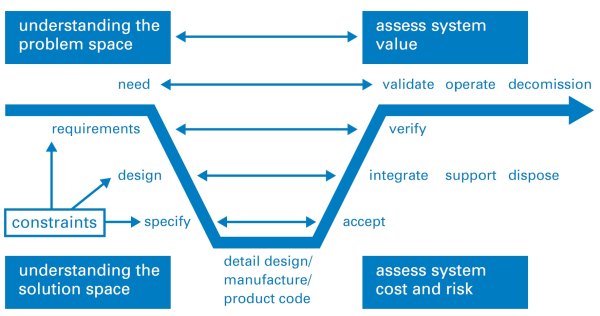 It does not know how to design itself to be safe, calm, efficient, high quality and affordable. It does not know how to do this because it has never learned that this is possible. But it is possible to do, and it is possible to learn, and that learning does not take very long or cost very much. And the return vastly outnumbers the investment. … if your frail elderly parents, relatives or friends were forced to endure a system that is far from frail safe; and you learned that this situation was avoidable and that a safer design would be less expensive; and all you hear is “can’t do” and “too busy” and “not enough money” and “not my job” … wouldn’t you feel a sense of righteous indignation? We form emotional attachments to places where we have lived and worked. And it catches our attention when we see them in the news. So this headline caught my eye, because I was a surgical SHO in Portsmouth in the closing years of the Second Millennium. The good old days when we still did 1:2 on call rotas (i.e. 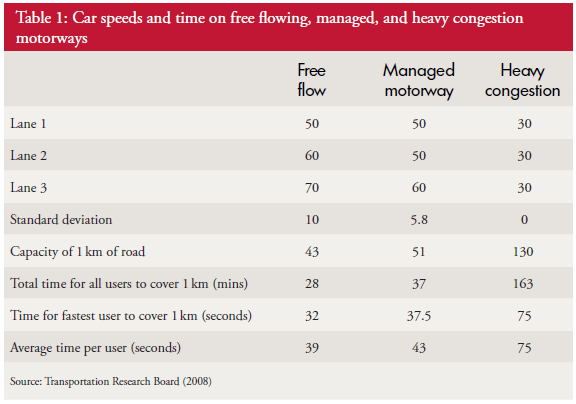 up to 104 hours per week) and we were paid 70% LESS for the on call hours than the Mon-Fri 9-5 work. We also had stable ‘firms’, superhuman senior registrars, a canteen that served hot food and strong coffee around the clock, and doctors mess parties that were … well … messy! A lot has changed. And not all for the better. Here is the link to the fuller story about the emergency failures. And from it we get the impression that this is a recent problem. And with a bit of a smack and some name-shame-blame-game feedback from the CQC, then all will be restored to robust health. H’mm. I am not so sure that is the full story. 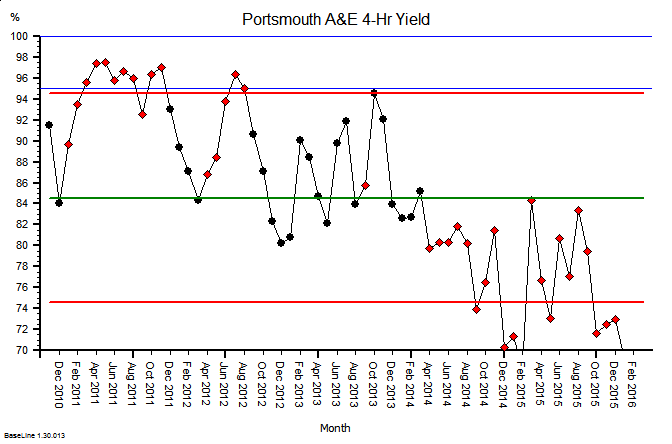 Here is the monthly aggregate A&E 4-hour target performance chart for Portsmouth from 2010 to date. It says “this is not a new problem“. It also says that the ‘patient’ has been deteriorating spasmodically over six years and is now critically-ill.
And giving a critically-ill hospital a “good telling off” is about as effective as telling a critically-ill patient to “pull themselves together“. Inept management. 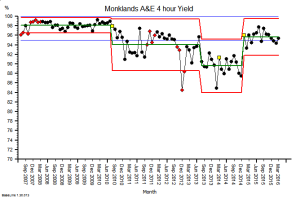 In A&E a critically-ill patient requires competent resuscitation using a tried-and-tested process of ABC. Airway, Breathing, Circulation. 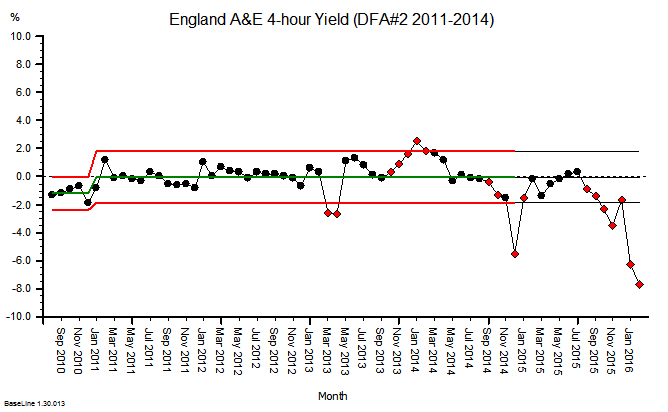 Also, the A&E 4-hour performance is only a symptom of the sickness in the whole urgent care system. 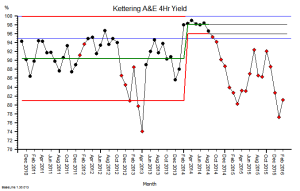 It is the reading on an emotometer inserted into the A&E orifice of the acute hospital! Just one piece in a much bigger flow jigsaw. 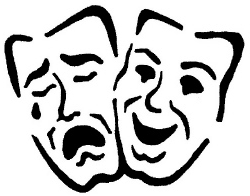 It only tells us the degree of distress … not the diagnosis … nor the required treatment. 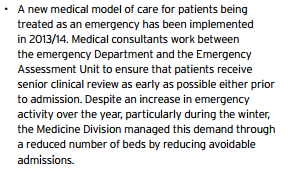 So what level of A&E health can we realistically expect to be able to achieve? What is possible in the current climate of austerity? Just how chilled-out can the A&E cucumber run? 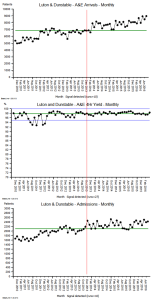 This is the corresponding A&E emotometer chart for a different district general hospital somewhere else in NHS England. 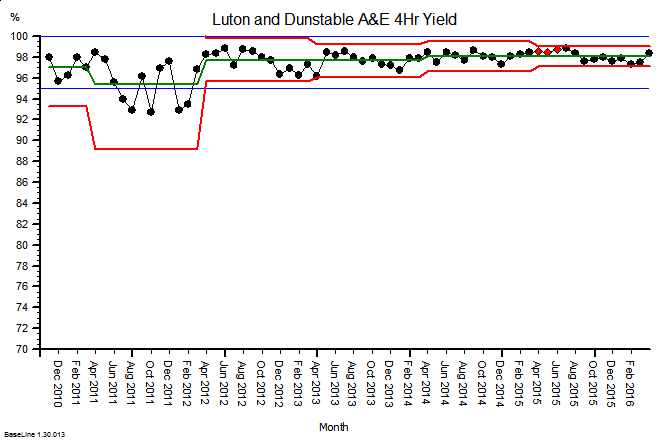 Luton & Dunstable Hospital to be specific. 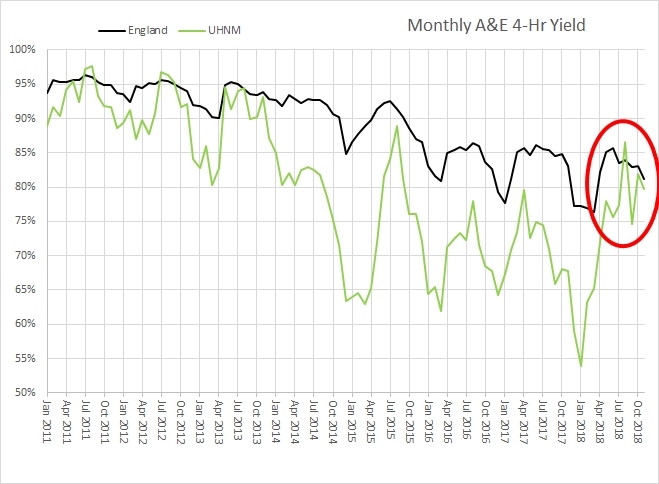 This A&E happiness chart looks a lot healthier and it seems to be getting even healthier over time too. So this is possible. 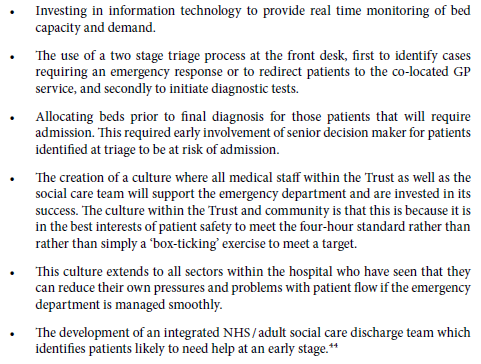 Yes, but … if our hospital deteriorates enough to be put on the ‘critical list’ then we need to call in an Emergency Care Intensive Support Team (ECIST) to resuscitate us. 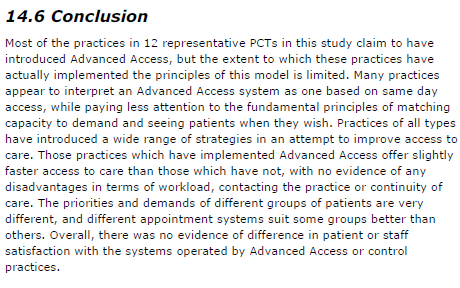 And how do their critically-ill patients fare? 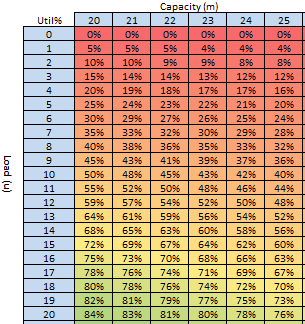 Here is the chart of one of them. 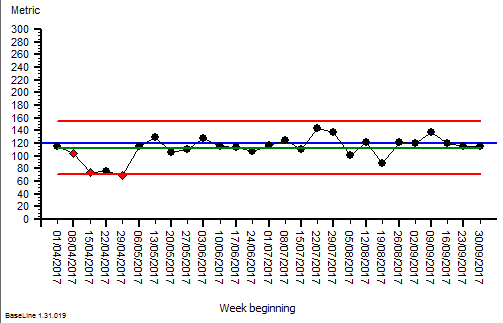 The significant improvement following the ‘resuscitation’ is impressive to be sure! But, disappointingly, it was not sustained and the patient ‘crashed’ again. Perhaps they were just too poorly? Perhaps the first resuscitation call was sent out too late? But at least they tried their best. An experienced clinician might comment: Those are indeed a plausible explanations, but before we conclude that is the actual cause, can I check that we did not just treat the symptoms and miss the disease? Q: So is it actually possible to resuscitate and repair a sick hospital? Is it possible to restore it to sustained health, by diagnosing and treating the cause, and not just the symptoms? 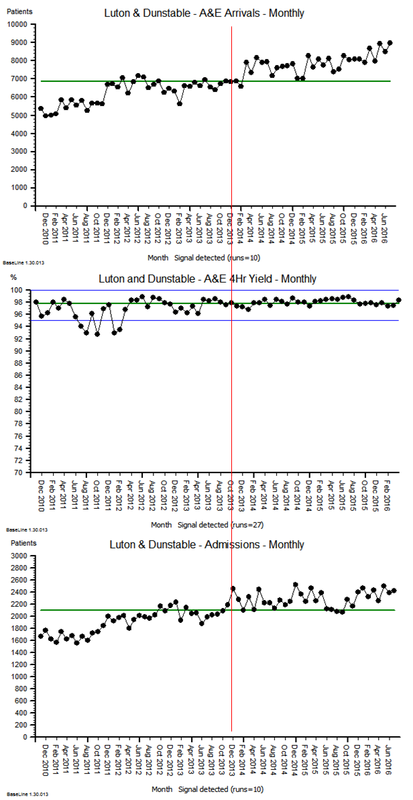 Here is the corresponding A&E emotometer chart of yet another hospital. 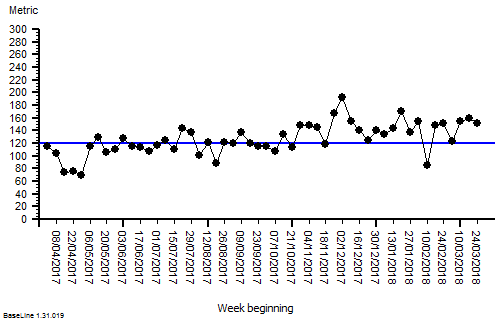 It shows the same pattern of deteriorating health. And it shows a dramatic improvement. It appears to have responded to some form of intervention. And this time the significant improvement has sustained. The patient did not crash-and-burn again. So what has happened here that explains this different picture? This hospital had enough insight and humility to seek the assistance of someone who knew what to do and who had a proven track record of doing it. Dr Kate Silvester to be specific. A dual-trained doctor and manufacturing systems engineer. Dr Kate is now a health care systems engineer (HCSE), and an experienced ‘hospital doctor’. 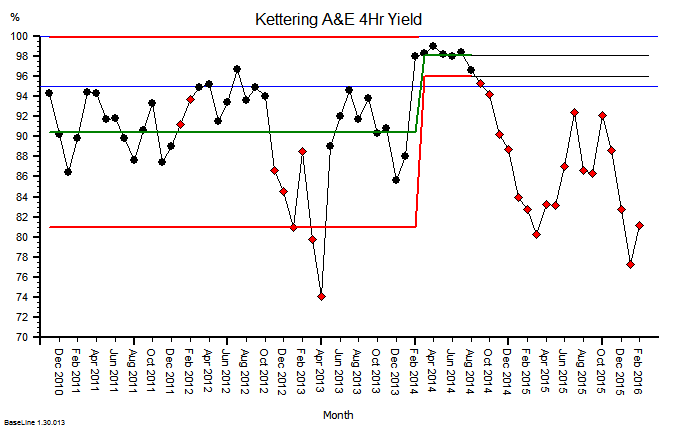 Dr Kate helped them to learn how to diagnose the root causes of their A&E 4-hr fever, and then she showed them how to design an effective treatment plan. They did the re-design; they tested it; and they delivered their new design. Because they owned it, they understood it, and they trusted their own diagnosis-and-design competence. And the evidence of their impact matching their intent speaks for itself. 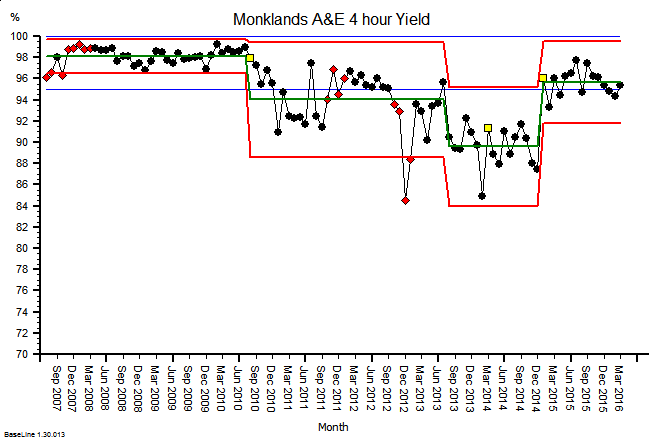 A few weeks ago I raised the undiscussable issue that the NHS feels like it is on a downward trajectory … and that what might be needed are some better engines … and to design, test, build and install them we will need some health care system engineers (HCSEs) … and that we do not have appear to have enough of those. None in fact. The feedback shows that many people resonated with this sentiment. 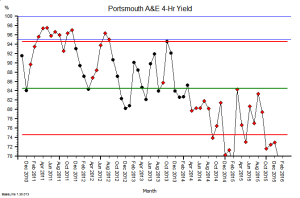 This week I had the opportunity to peek inside the NHS Cockpit and look at the Dashboard … and this is what I saw on the A&E Performance panel. 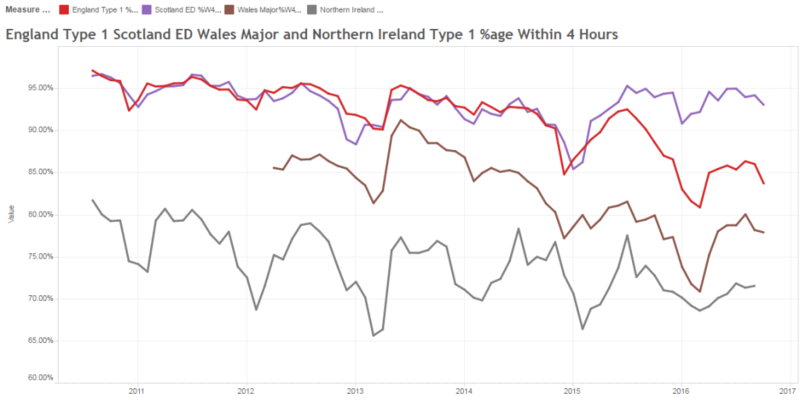 This is the monthly aggregate A&E 4-hour performance for England (red), Scotland (purple), Wales (brown) and Northern Ireland (grey) for the last six years. 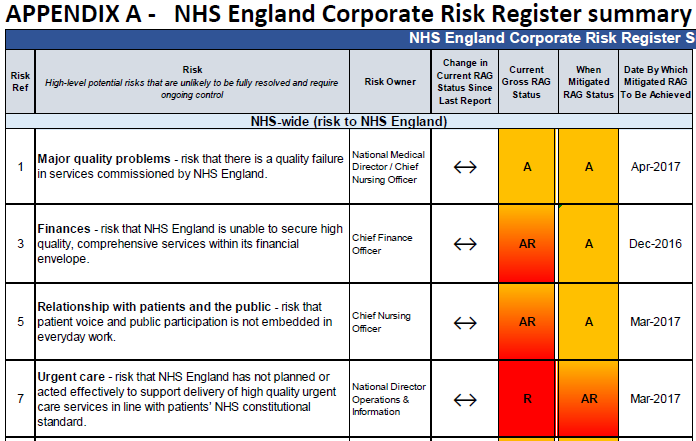 The trajectory looked alarmingly obvious to me – the NHS is on a predictable path to destruction – a controlled flight into terrain (CFIT). The repeating up-and-down pattern is the annual cycle of seasons; better in the summer and worse in the winter. This signal is driven by the celestial clock … the movement of the planets … which is beyond our power to influence. 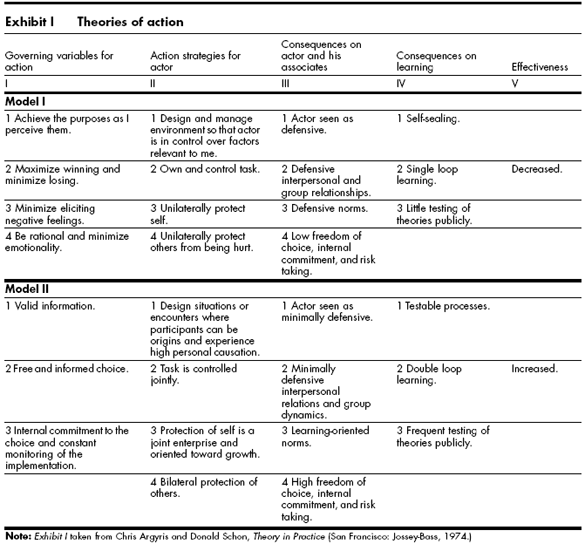 The downward trajectory is the cumulative effect of our current design … which is the emergent effect of our collective beliefs, behaviours, policies and politics … which are completely within our gift to change. If we chose to and if we knew how to – which we do not appear to. Our collective ineptitude is not a topic for discussion. It is a taboo subject. 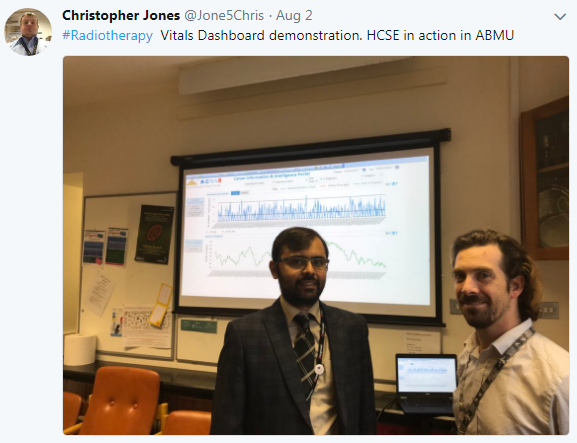 And I know that because if it were for discussion then this dashboard would be on public view on a website hosted by the NHS. It was created by George Donald, a member of the public, a disappointed patient, and a retired IT consultant. And it was shared, free for all to see and use via Twitter (@GMDonald). 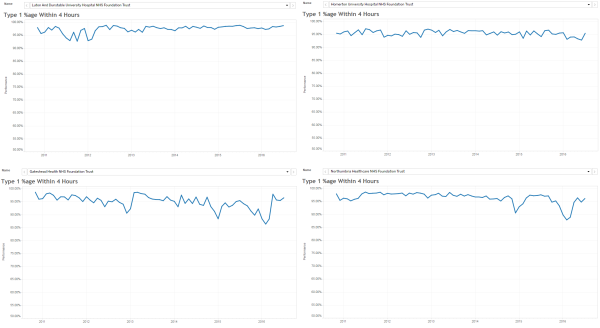 The information source is open, public, shared NHS data, but it takes a lot of work to winkle it out and present it like this. So well done George … keep up the great work! 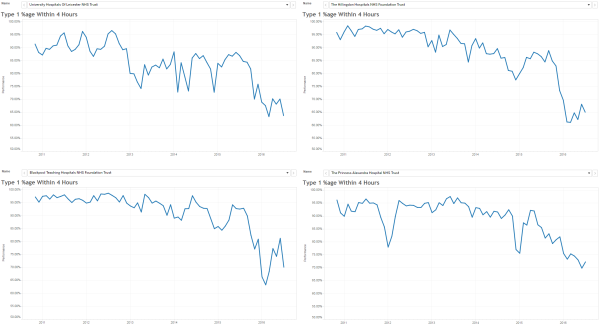 Now have a closer look at the Dashboard Display … look at the most recent data for England and Scotland. What do you see? Does it look like Scotland is pulling out of the dive and England is heading down even faster? Hard to say for sure; there are lots of signals and noise all mixed up. So we need to use some Systems Engineering tools to help us separate the signals from the noise; and for this a statistical process control (SPC) chart is useless. 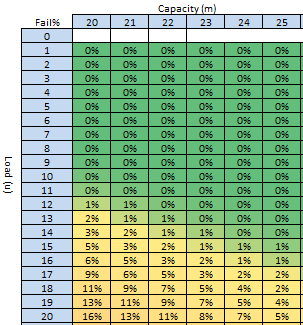 We need a system behaviour chart (SBC) and its handy helper the deviation from aim (DFA) chart. 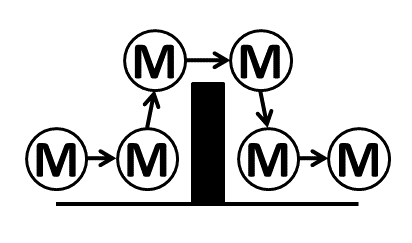 I will not bore you with the technical details but, suffice it to say, it is a tried-and-tested technique called the Method of Residuals. 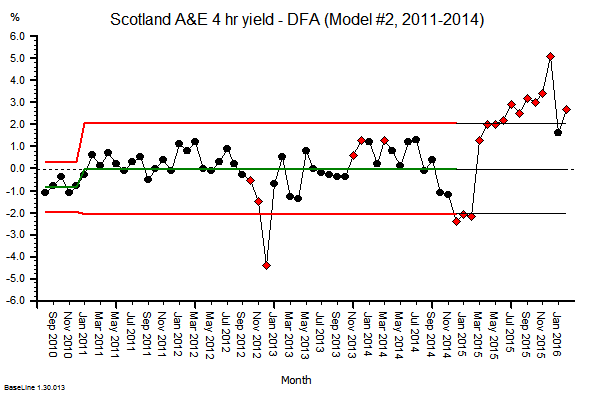 Exhibit #1 is the DFA chart for Scotland. The middle 4 years (2011-2014) are used to create a ‘predictive model’; the model projection is then compared with measured performance; and the difference is plotted as the DFA chart. What this “says” is that the 2015/16 performance in Scotland is significantly better than projected, and the change of direction seemed to start in the first half of 2015. This evidence seems to support the results of our Mark I Eyeball test. Exhibit #2 – the DFA for England suggests the 2015/16 performance is significantly worse than projected, and this deterioration appears to have started later in 2015. Oh dear! I do not believe that was the intention, but it appears to be the impact. So what are England and Scotland doing differently? What can we all do differently in the future? Isn’t that a question that more people like you, me and George could reasonably ask of those whom we entrust to design, build and fly our NHS? Isn’t that a reasonable question that could be asked by the 65 million people in the UK who might, at any time, be unlucky enough to require a trip to their local A&E department. 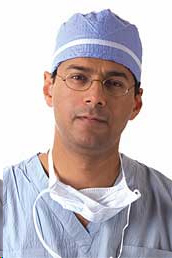 We are suffering from mass ineptitude and hubris, to use Dr Atul Gawande’s language, and we need a better collective strategy. Some innovative hospitals have had the courage to grasp the nettle. They have seen what is coming; they have fully accepted the responsibility for their own fate; they have stepped up to the challenge; they have looked-listened-and-learned from others, and they are proving what is possible. They have a name. 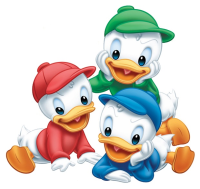 They are called positive deviants. Have a look at this short video … it is jaw-dropping … it is humbling … it is inspiring … and it is challenging … because it shows what has been achieved already. It shows what is possible. Now, and here in the UK.